Garden Grill is located in Epcot’s The Land Pavilion and serves breakfast, lunch and dinner. All meals are served family style. It is a notable location for a number of reasons. First, is that it is the only rotating restaurant at Disney World. Second, it is one of only a few restaurants that overlooks a ride. Finally, it is a character meal but given the unique setup of this restaurant, Garden Grill provides a more personal character experience. We will elaborate on all of these further here in our Garden Grill Breakfast review. The Land is one of the original Future World pavilions at Epcot. As the pavilion evolved and changed over time, so has this restaurant. It was originally named “The Good Turn Restaurant”, probably to draw attention to its rotating feature. A few years later in 1986, the restaurant was renamed “The Land Grille Room”. 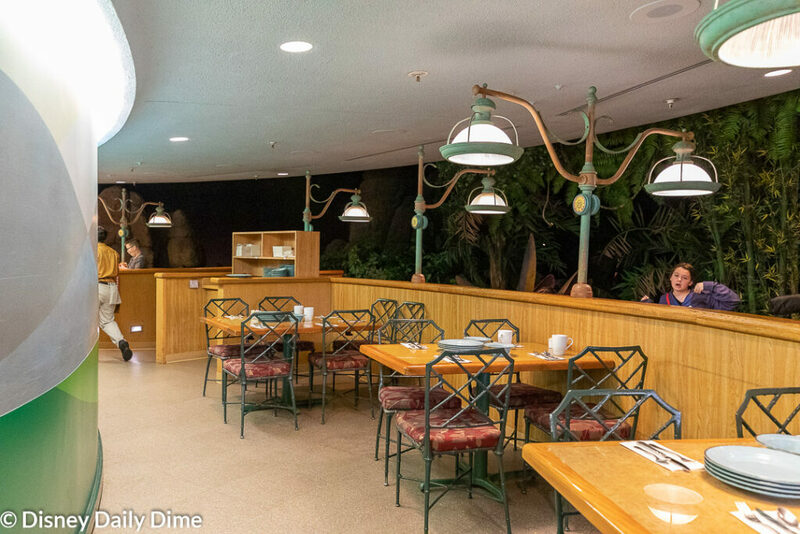 Finally, during the renovations to the Land Pavilion in the early 90s, the restaurant became the Garden Grill. Due to the increasing demand and popularity for character meals, characters were added which brings us to the iteration of the restaurant we have today. 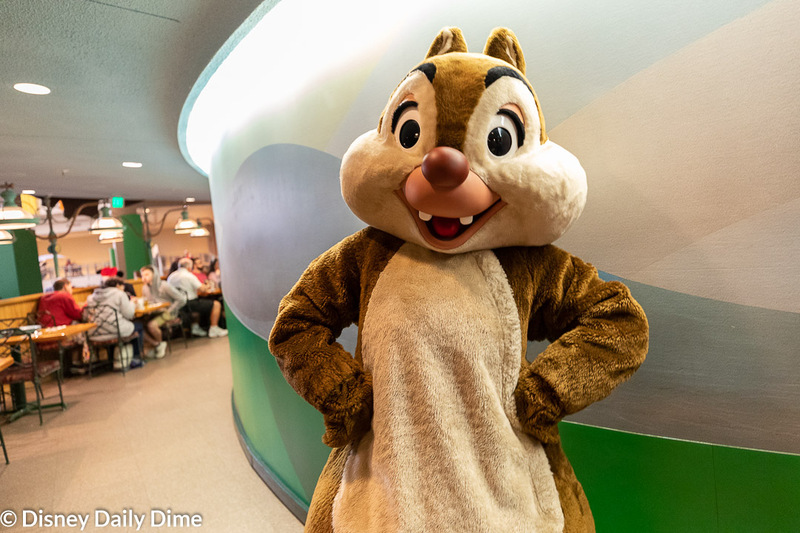 Officially, the character meal is called Chip ‘n’ Dale’s Harvest Feast. It has this name regardless of whether you eat breakfast, lunch or dinner here. 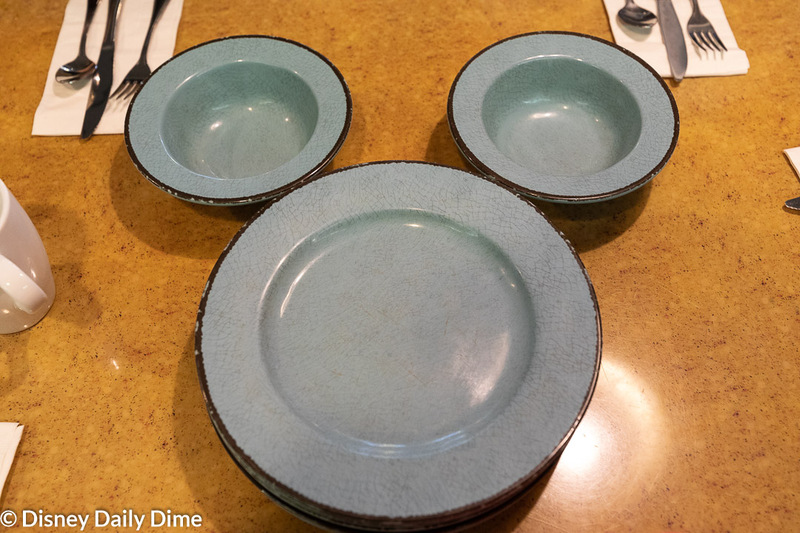 Garden Grill will cost one table service credit on the Disney Dining plan. As it is a character meal, there is a “premium” price attached to this meal, which almost always makes it good use of a credit. Breakfast will cost around $40 adult/$25 child and lunch/dinner costs $52/adult and $31/child. As Garden Grill is a rotating restaurant, it is one large circle with two tiers of seating facing outward. The bottom tier is comprised of semi-circle shaped booths while the top tier is all tables. The bottom tier is obviously preferred as everyone gets a great view of the scenery. A portion of the circle overlooks the Living with the Land ride below. Diners will overlook the rainforest, desert, prairie and farmhouse scenes. You are even treated to a view that riders do not get – a peek into one of the rooms of the farmhouse. This is one of many examples of the extra touches that sets Disney apart and that we love to look for and enjoy. It takes a little over an hour to complete the rotation, which is about how long the meal should last. If you are prone to motion sickness, do not worry. The restaurant is moving so slowly that you will barely feel it. I feel like you have to be really paying attention or looking at a fixed spot to realize that you are moving. My mom is extremely sensitive to motion and she has dined here multiple times without any issue. It may feel slightly weird for a couple of seconds as you exit the restaurant but it is hardly noticeable and the feeling goes away quickly. As part of Chip ‘n’ Dale’s Harvest Feast, Garden Grill also features four beloved characters: Mickey, Pluto and your “hosts” Chip and Dale. 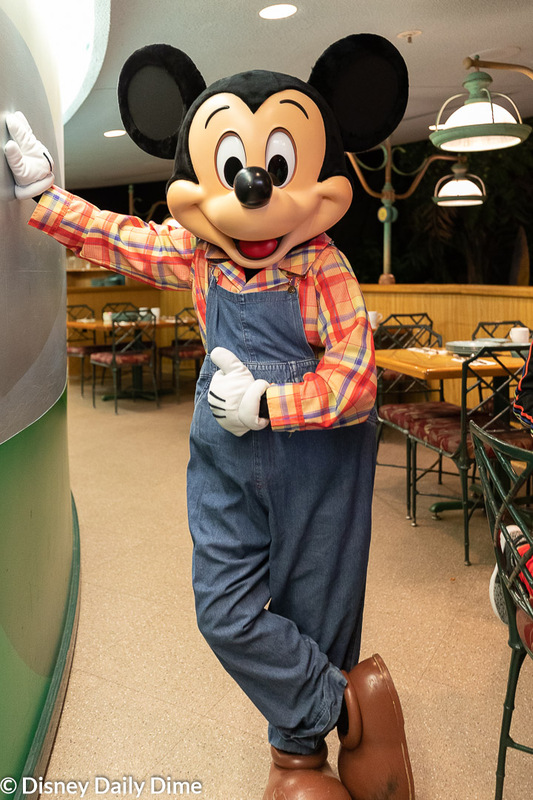 Mickey is even wearing a his “Farmer Mickey” attire which makes this a special photo opportunity with him. Pluto sports a blue and white checked bandana. Chip ‘n’ Dale are sporting their traditional looks. Due to the seating configuration and lack of a buffet, this is one of our favorite character meals. If you are sitting in the bottom tier, you don’t even see the characters until they are at your table. It provides a more personal experience with the characters as it is just you and them with no other tables surrounding you. Even on the top tier which is a single row of tables, you will still experience this more personal interaction. You just may have to dodge the cast members whisking by with food for other tables. 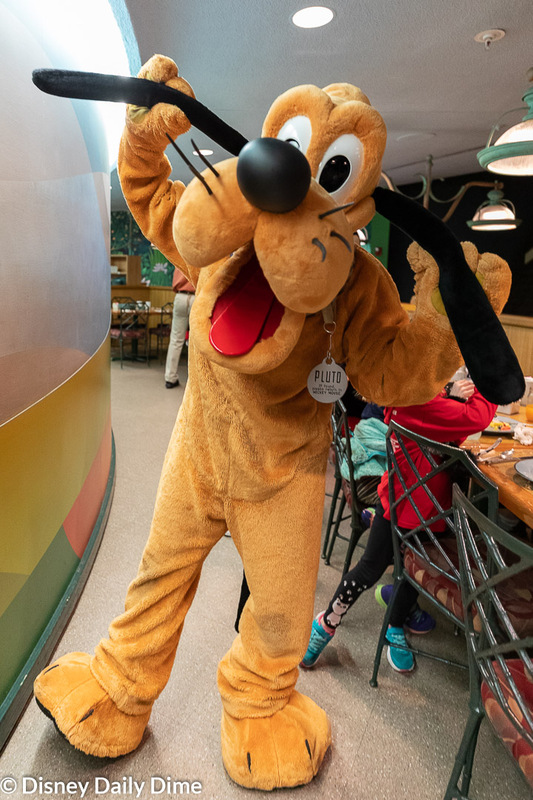 While not guaranteed, the characters often seem to make it around more than once, so there is a good chance you may see a character or two twice during your meal. 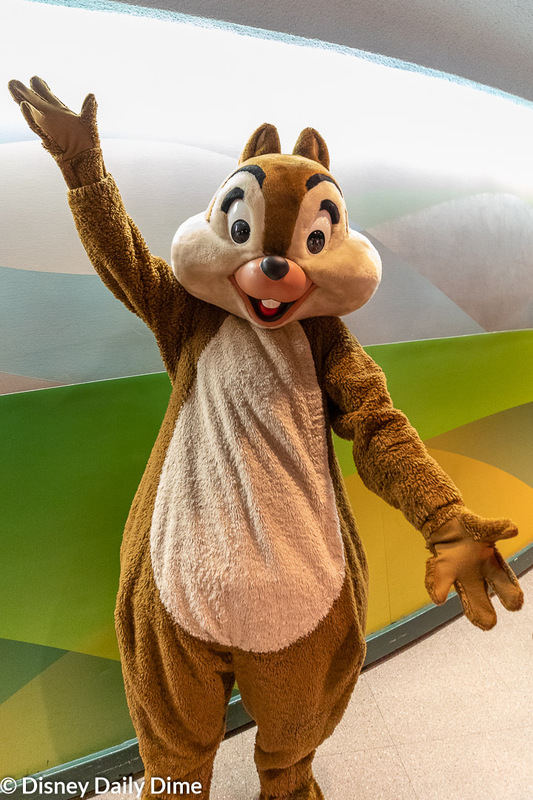 If you want to have a really great interaction with Chip ‘n’ Dale you should wear a shirt with them on it. Elsa had a Dale shirt on the day we went and he was quite enamored with her. I think he made a stop at the table that was sort of out of rotation just to see her. As stated above, the Garden Grill breakfast is served family-style. This can be a great way to take in a character meal that is not a buffet. When Anna and Elsa were small, this meal was a bit of a relief as it was nice not navigating a buffet with them. On this particular day, we had my parents and our close family friend with us (so six adults and 4 kids total). Chip and Dale’s Harvest Feast provides a delicious and extensive breakfast meal to enjoy. 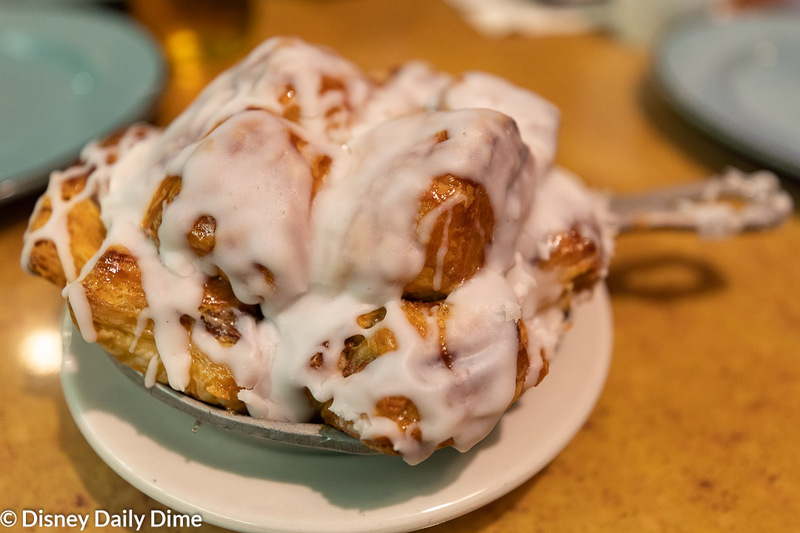 After your server takes your drink order (non-alcoholic beverages are included with the price of your meal or you can buy a Mimosa or Bloody Mary), a delicious fruit bowl and Chip’s Sticky Bun Bake are delivered to the table. The kids were happy to see the fruit but they were ecstatic to see the sticky bun! It was a challenge to keep them from filling up on it and the fruit before the “entrée” platter was served. The fruit bowl was the typical melon/cantaloupe/pineapple/grape mix but it also included an abundant amount of strawberries and some blueberries. The sticky bun was the highlight of our Garden Grill breakfast. It was served warm so the cinnamon swirls and the frosting combined with the fluffy pastry to make it gooey and delicious. 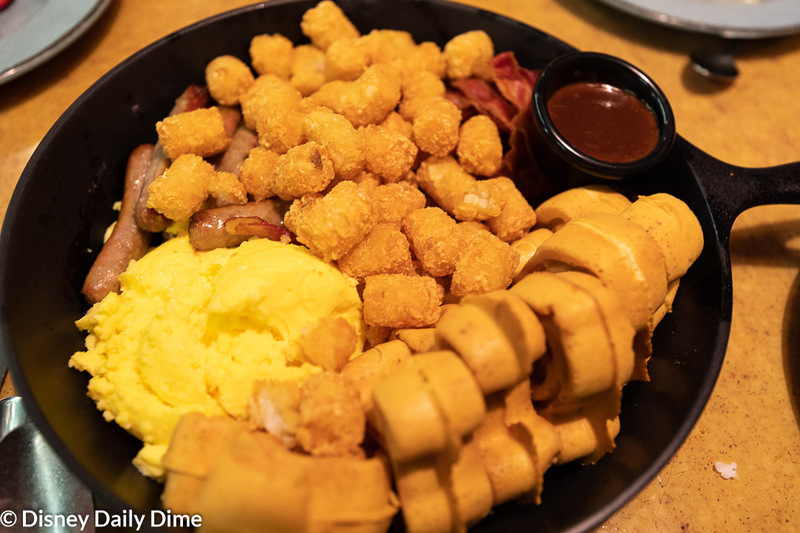 The main platter was filled to the brim with breakfast specialties including scrambled eggs, bacon, sausage links, potato barrels, and the most important part – Mickey waffles. The waffles were served with a chocolate-hazelnut drizzle that was basically melted Nutella. It took the crisp and fluffy waffles to the next level of amazing (if you like Nutella, that is!). The waffles were also served with a gravy boat full of maple syrup. The bacon was the typical thin sliced bacon served all over Disney World. It isn’t anything amazing but it is perfectly cooked and does the trick. The sausage links were a standard link, nothing notable but a savory accompaniment to the meal that cuts the sweetness of many of the items. The scrambled eggs tasted more like they were mass produced and probably from a liquid egg base. They were fine but we could all tell that they weren’t freshly cracked eggs. Finally, the hash brown style potato barrels are a fancy name for tater tots. They were crisp, salty and tender on the inside. This meal is also all your care to enjoy, so you may order additional items as needed. We had two entire platters, fruit bowls and sticky buns brought to our table to feed 9, while I had my own separate gluten friendly platter. The platters are plentiful so we didn’t find that we needed to order much more, but we did request some additional fruit and an extra sticky bun (because they were so good!). When it’s all you care to eat, why not!? Everyone single one of us enjoyed the meal. It wasn’t anything creative or inventive as far as breakfast goes, but it gave us a hearty, warm and comforting meal to start the day. 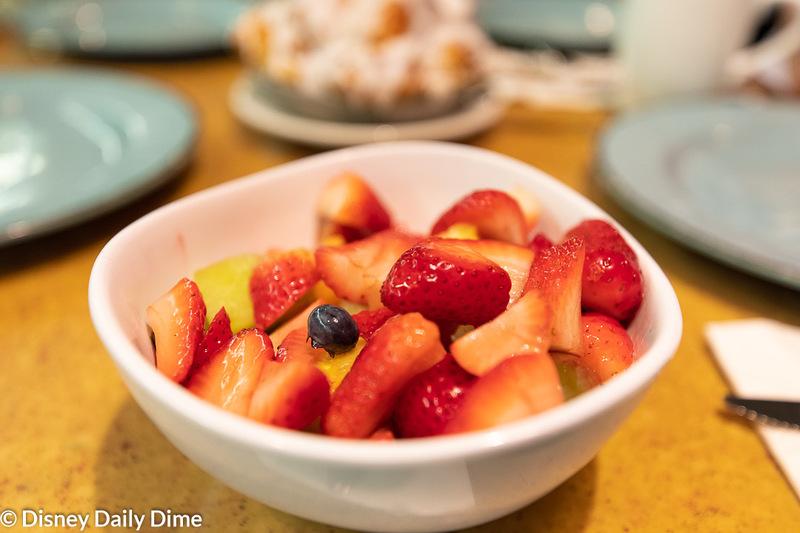 If you are considering character meals for breakfast, we highly suggest you consider Garden Grill breakfast. The family style service is a great reprieve from the bevy of buffet-based character meals. In addition, the novelty of the rotating restaurant overlooking a ride is definitely a fun bonus to the atmosphere. The character interactions we have had here are always top notch. The characters seem to spend a longer time with each table here than other character meals we have been at. It is without a doubt the most relaxed character meal we have experienced since you aren’t running up to a buffet and trying to make sure you don’t miss any characters. This advantage can’t be overlooked in our opinion. If you book an early PPO (pre park opening) reservation for Chip and Dale’s Harvest Feast, you may also have an advantage to finishing your meal and hopping on Soarin early before the crowds hit. You can read more about how we use some early PPO meals to get a touring advantage. We ate here at Christmas, and the ADR also saved us from standing in the massive rope drop crowd and allowed us an easy, relaxed stroll through Future World outside of the masses. The mix of Mickey, Pluto, Chip and Dale provides a fun character lineup and great photo opportunities. Those chipmunks are always silly and funny and have provided a lot of special moments. While the food isn’t exceptional, we still think Garden Grill provides a delicious standard breakfast. If you’re not loooking for the fur characters and would prefer a princess breakfast we’d definately suggest checking out the Bon Voyage Adventure Breakfast over at Disney’s BoardWalk Inn. With that, we’ll wrap up our Garden Grill breakfast review. We consider this one of the best character meals due to the fun characters, not having to go to a buffet and the unique restaurant setting that really provides some quality character time. Even if characters aren’t your thing, overlooking Living With The Land while slowly rotating also provides a special experience that will really appeal to fans of the ride. If our Garden Grill breakfast review was helpful, or at least entertaining, please like and share this with your friends or anyone you think will find it useful. Just use the sharing buttons on the page. We always appreciate it when you share our posts, as it allows us to spread the word about our blog and hopefully allows us to help others.